The Seattle weather is warming up, flowers are blooming, and spring showers are around the corner. 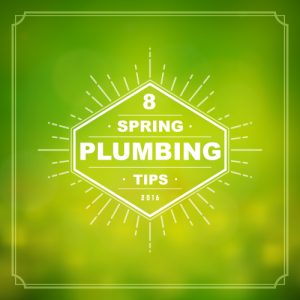 We here at Bob Oats want to make sure that your plumbing is prepared so we have compiled eight helpful tips for you to follow around your home. 1) Do your kids like to help out around the house? Have them check for hidden toilet leaks. Just add a few drops of food coloring to the toilet tank. If the toilet is leaking, color will appear in the bowl within 30 minutes. We recommend avoiding using red though. It might stain your toilet. 2) Make sure your toilets flush properly. If the handle must be held down thorough out the flush or jiggled to stop the water from running you may need to replace worn out tank parts. They don’t cost much plus you’ll see a lower water bill. 3) Make sure yard drains, gutters and downspouts are cleaned out and free of debris that may have got in there over winter. 4) Drain strainers are a great way to stop clogging and keeping stuff like soap, hair, and food out of your pipes. 5) Make sure the water heat isn’t set to high. Check the temperature setting on the water heater. If it’s higher than 120°F turn it down to prevent your skin from scalding. Doing so will also save money and energy. 6) Check your sump pump, make sure it works well. Heavy spring rains can cause a flood if it’s not working correctly. 7) Check for slow leaks. This can be done by taking a reading on your water meter before bed. The next morning you will take another. Without using any water overnight, the reading should be the same. 8) If you are too busy you can give us a call and we will give your house a thorough walk-through to make sure every thing is working well.